The question of whether or not to temporarily close Butler Street for 30 days now rests with Marietta Mayor Joe Matthews. 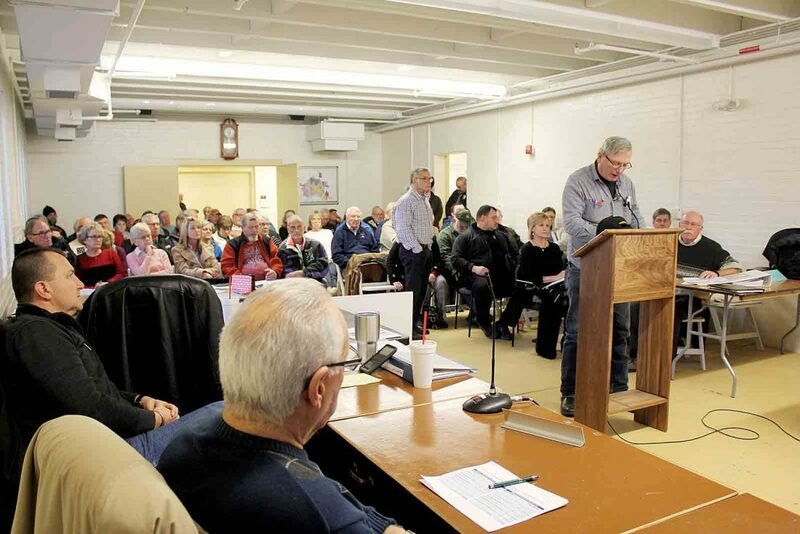 Wednesday Marietta City Council, city administration and more than 75 members of the public attended a Council Streets Committee meeting to hear the results of a traffic impact study conducted reviewing the intersections and roads surrounding Marietta College. The crowd in attendance Wednesday was predominately against a potential permanent closure of Butler Street between Seventh and Fourth streets, but before they spoke or asked clarifying questions on the study, Chairwoman Kathy Downer introduced Ed Williams of TEC Engineering and had Williams present the findings of the study. Williams explained the parameters of the study, the data found, how a public survey available both in print and online informed additional questions addressed in the study and the resulting recommendations from TEC concerning both options–to permanently close the street and vacate the right of way to the college or to keep the road as a city asset and liability. In summary, TEC’s findings conclude that a closure and vacation would not negatively impact the traffic flow of the surrounding streets and would cost the city less in infrastructure repair and upkeep over the next 20 and 40 years, but the study also tabulated needed repairs and changes to surrounding streets if the city retains ownership of the right of way and keeps the road open. 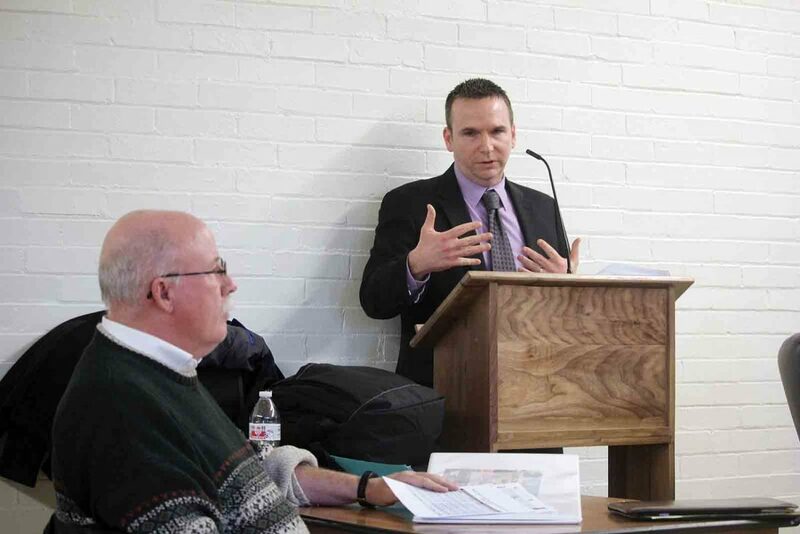 City Engineer Joe Tucker explained the bottom dollar of needed short and long term repairs. He said the cost difference between keeping Butler Street open and closing it is $206,000, with the more expensive path resting in keeping the street open. “There are repairs and changes that need to be made to surrounding streets and intersections either way,” he explained, noting the shared cost between the two options is $305,000 to increase lane lengths through restriping and potential changes in on-street parking, lane width improvements, retiming of traffic signals, a dedicated right turn only lane at the Williamstown Bridge from Greene Street headed eastbound, and enhancements to the five-way intersection at Seventh, Putnam and Glendale. Then Williams explained that the study utilizes data and traffic engineering industry assumptions which can be confirmed or refuted by an additional study. He recommended that the city allow for that additional review by conducting a temporary closure of the street for 30 days. The decision to close the street temporarily rests with Matthews, who said Wednesday he has not yet decided if he would support a temporary closure. 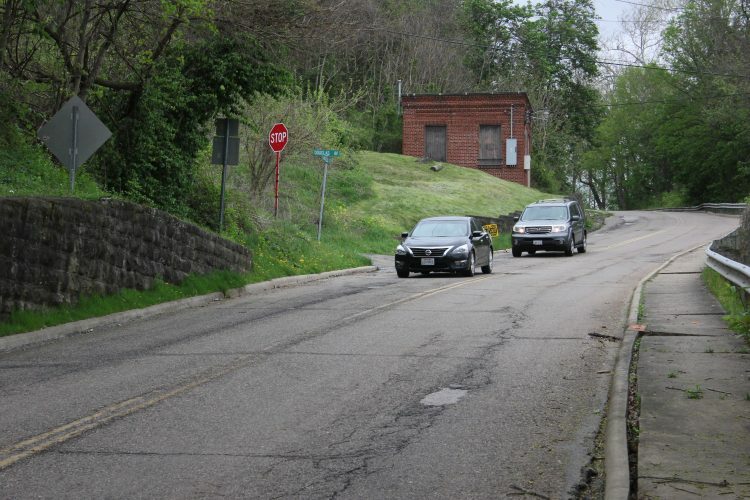 If Matthews were to agree to close the street temporarily, then either Marietta College could pay outright for the additional study (approximately $10,000) or Marietta City Council could authorize the city to act as a pass-through of the college funds and pay for the additional study. Finance Chairman Mike Scales said if the financial appropriation were to again be addressed by council he would not support nor introduce such legislation. Without his support, either two members of that committee or three members of council as a whole would need to introduce the appropriation as legislation for a vote. The earliest that vote to fund additional study could take place is Feb. 21; if five members of council vote in favor of that appropriation with a legislative emergency clause, the temporary closure could be conducted in March. If two members of finance committee or three members of council as a whole introduce the legislation without an emergency clause as early as Feb. 21, the legislation would still have to sit for 30 days before the city would be authorized to pay for the additional study–pushing that temporary closure into April or later. Note: If Mayor Matthews authorizes the temporary closure and the college pays for the study outright, no time restraint outside of the mayor’s authorization would stop the temporary closure from happening sooner than March. Williams explained Wednesday that the study reviewed both past data from the Ohio Department of Transportation and previous TEC counts and timing studies of signals through the city as a historical comparison for traffic counts gathered during the week of Nov. 7-14, 24 hours a day for that week. He explained those counts were used to provide an average daily traffic count and were used to determine when peak traffic occurs on the roads between 7 a.m. and 9 a.m. each day capturing middle school drop off traffic in the morning, 11 a.m. and 1 p.m., 4 p.m. and 6 p.m. in the evenings. 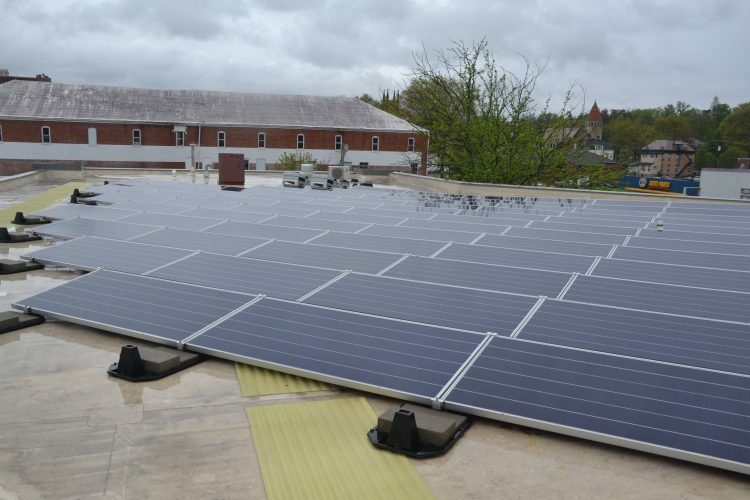 He also explained that an additional time was studied during a Marietta College basketball game to determine peak usage during a special event at the college. Then with those counts, Bluetooth technology also allowed for the study to visualize routes that a representative percentage of vehicles take throughout the study zone–between Greene Street, Seventh Street, Putnam Street and Third Street. The results of that data collection and routing allowed for recommendations concerning lane capacity, driver and pedestrian safety, emergency vehicle safety, flooding and traffic coming from Norwood. Queues, or the length of time a car is stuck in a block waiting for its turn at a signal to move through an intersection, was addressed in the study alongside the space to hold that number of cars between signal changes. Most surrounding routes were deemed to currently have insufficient lane space, causing traffic backups which need to be addressed regardless of closure. For travelers headed south on Third Street at the Greene Street intersection, TEC determined that the current length is not sufficient for the traffic queues, currently backing up drivers to the Butler Street intersection. On Fourth Street at the Greene Street intersection, the only lane determined sufficient for existing traffic was the northbound lane. But both of Greene Street’s east and westbound lanes and Fourth Street’s southbound lane were determined insufficient. The recommendation for all three lanes from TEC was to restripe, begin tapers at the Rite Aid and KFC entrances and restrict some parking on the southbound side of Fourth Street. Adjustments to the Greene Street and Williamstown Bridge intersection were determined by TEC to be too costly based on constraints of the bridge. Though the lengths of lanes approaching the intersection were deemed insufficient, no change in striping is recommended. On Seventh Street, recommendations from TEC vary by intersection and whether or not the city moves to close Butler Street to thru-traffic. At the Greene Street intersection and farther north at the Butler Street intersection, restriping could lower waiting queues. ¯ Restriping on the eastbound lanes of Putnam for both righthand turning onto Seventh and for the main lane which heads up to Marietta High School, out Glendale Road or north into Marietta’s Third Ward, plus potentially restricting parking on the westbound side. ¯ For the northbound lane of Seventh, TEC notes the existing lane lengths are sufficient for current traffic, but would not sustain growth in traffic whether or not Butler Street is closed to thru traffic. ¯ For the southbound lane of Seventh, TEC determined no upgrades in either scenario would be needed. Williams explained how Bluetooth and traffic counts helped determined how many of those vehicles counted on Butler Street used the passage as a thru-street versus access to parking on campus. By that measurement, 71.77 percent of the drivers using Butler Street in the morning use it as a thru-street. Of those using the road as a thru-street from Seventh Street, the study explains that 56 percent are headed toward Third Street and downtown Marietta, while 33 percent head north up Fourth Street and the remaining 11 percent head toward the Ohio River on Fourth Street. Williams explained that the redistribution of that 248 average number of vehicles would not negatively impact the surrounding intersections, but that the Bluetooth modeling could be confirmed or refuted by additional study with a temporary closure for 30 days. Attendees at previous council meetings on the issue and respondents to the survey noted concern over near-misses in traffic crashes because of congestion in the area and on Butler Street. Though the study notes that traffic data from both the city’s emergency response and from Ohio Department of Transportation considers the area as not a high-incident area, it concedes that the data doesn’t account for near-misses. The study notes that the preferred route for fire, ambulance and police vehicles from downtown out to Norwood and the Pike Street commercial development is through Butler Street. Marietta police chief said after the committee meeting that the route is preferred for its lower traffic count and less of a risk in oncoming traffic from the opposing lane if the emergency vehicle has to move around a car or other obstruction in the usual path. Field data collection from video of the Fourth and Butler Street intersection showed eight police cruisers and four ambulances pass through the intersection between 6:45 a.m. and 9:45 p.m.
“However none had emergency lights on,” noted the study. Ohio River Flood Stages, as determined by the Federal Emergency Management Agency, were also incorporated into the study, said Williams. He said that the lowest elevations of Butler Street would put the street underwater at the same time that Greene Street in the same Seventh through Fourth block would be underwater. 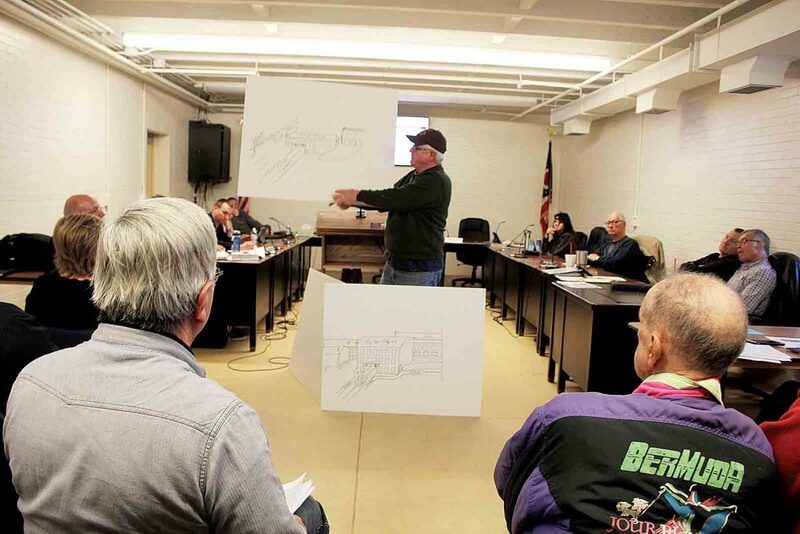 Members of the audience loudly opposed that determination during the meeting Wednesday, with echoing comments that they had never seen Butler underwater when the State Route was underwater in the past. The most vocal opponents of the closure of Butler Street came from residents of Norwood. The study concluded that if Butler Street between Fourth and Seventh were closed, travelers coming from Norwood and headed downtown, north or around to Greene and Pike streets eastward would only increase their drives by at most 17 seconds. Norwood resident Jim Bennett among many others spoke against the closure because of a yet-unstudied impact to the residents who must use Quarry Street to navigate through the rest of the city. Marietta College President Bill Ruud said his main takeaway Wednesday night was positive. He said the traffic impact study is part of a larger planning effort for the college including a recently completed economic impact study on the area so that the college can plan for future investment and enrollment. In future articles the Marietta Times will further unpack the TEC recommendations for improvements, potential funding sources City Engineer Joe Tucker would consider for such improvements, and additional data collected in the study, and as the college makes options it is considering for development of the campus available, the Times will also continue to report those.